Below are Box Office Collection Report of bollywood film 'Karwaan' With his review, budget and total box office and worldwide collection status. 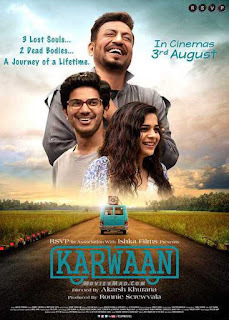 Karwaan movie lead star cast is Irrfan Khan, Mithila Palkar. Karwaan is an indian Comedy, Drama Film of 2018, directed by Akarsh Khurana and produced by Ronnie Screwvala, Priti Rathi Gupta. Irrfan Khan's Karwaan, who was suffering from cancer, got a great review. Its direct benefit was seen in the film collection. And Audience to much like Irrfan Khan, Salman Dulkar and Mithila Palkar's performance.